Fantastic model tonight. How could we be so lucky to have two great male models (almost) in a row (see February 12th)? For the model tonight seemed to know intuitively what poses create true interest. Weight changes. Tension – and/or lack of it. Being comfortable in your own skin. Well, OK, I was also experimenting – with some success – with my new skin tone pastels. Maybe both factors coming together? Below six (count ’em, six) fifteen minute figure studies. (that means that almost every one turned out interesting, since we usually do seven in total). Conté crayon with conté pencil on tinted pastel paper. 32.7 x 50 cm. or 13 x 19.75 in. Three gesture drawings. Charcoal on tinted brown sketching paper. 35 x 50 cm. or 13.75 x 19.75 in. This entry was posted in Drawings, Figure Studies and tagged 15 minute figure study, 4 minute figure studies, Belgium figure drawing sessions, figure drawing, figure drawing Bruges, figure drawing on toned paper, figure study, figure study heightened with pastel, figure study with pastel, gesture figure studies on February 26, 2018 by ellentrezevant. Second drawing session in San Clemente, California. Though there was no instructor, there was a supervisor who managed the session. He liked to play music, which I always find helpful for expansion. Interestingly though, here in California he liked to play French chanson, while in Belgium where I usually draw, Bruno usually likes to play American country-western jazz. In both cases, the music supports a subtle embrace of otherness – yet in both cases, a different otherness. Nice, you wouldn’t notice it – unless you noticed it. I found the benches in the SC Art Supply a little hard. So it was a challenging and not a hugely successful session. But here are a few from the afternoon that made the grade. Conté pencil on tinted pastel paper highlighted with conté crayon. 30.5 x 40.5 cm or 12 x 16 in. This entry was posted in Drawings, Figure Studies and tagged figure drawing San Clemente, figure study on March 5, 2017 by ellentrezevant. Ina, from South America. Not one of my favorite models, simply because her posing is not very creative. So I’m always glad if a few drawings make the cut. Actually, the highlighted one included here is a pretty good likeness of her. Conté pencil highlighted with conté crayon on toned pastel paper. 32.5 x 50 cm or 13 x 19 3/4 in. Three four minute poses. Conté pencil on toned sketching paper. 35 x 50 cm. or 13 3/4 x 19 3/4 in. This entry was posted in Drawings, Figure Studies and tagged figure drawing Bruges, figure study, figure study heightened with pastel on April 25, 2016 by ellentrezevant. Tonight felt like a bit of a breakthrough for me. I’ve just started using the sienna toned paper. But which color to use to draw the figure? And then what pastels to use for the highlights? It needs to become intuitive – as it did in this spotlighted one. Three fifteen minute studies. One above and two below. Conte pencil tightened with conté crayon on toned pastel paper. 32.5 x 50 cm or 13 x 19 3/4 in. Three four minute studies. Charcoal on toned sketching paper. 35 x 50 cm. or 13 3/4 x 19 3/4 in. This entry was posted in Drawings, Figure Studies and tagged 15 minute figure study, conte crayon and pastel on pastel paper, figure study on August 10, 2015 by ellentrezevant. Conte crayon on pastel paper. July 2015. 30 x 45 cm. or 11 3/4 x 17 3/4 inches. This entry was posted in Drawings, Figure Studies and tagged 15 minute figure study, drawing from a live model, figure drawing, figure study on July 6, 2015 by ellentrezevant. 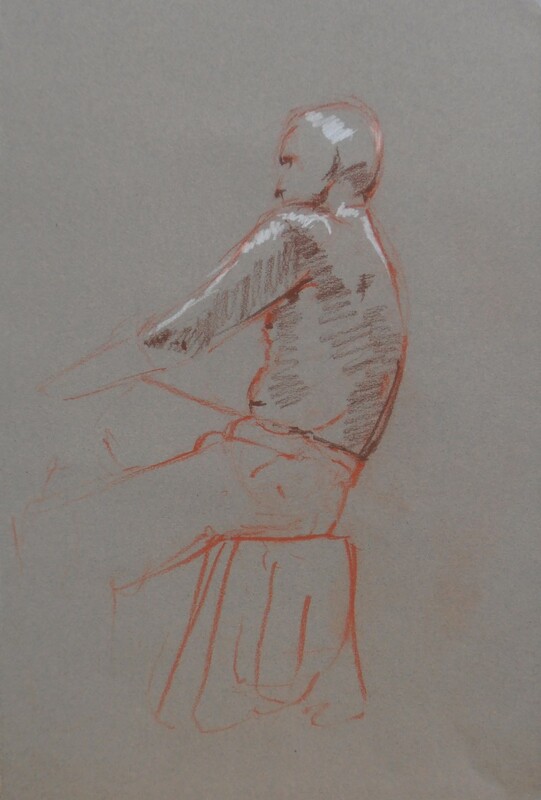 Figure study, September 2014. Conte crayon on toned paper. 30 x 45 cm. or 11 3/4 x 17 3/4 inches. 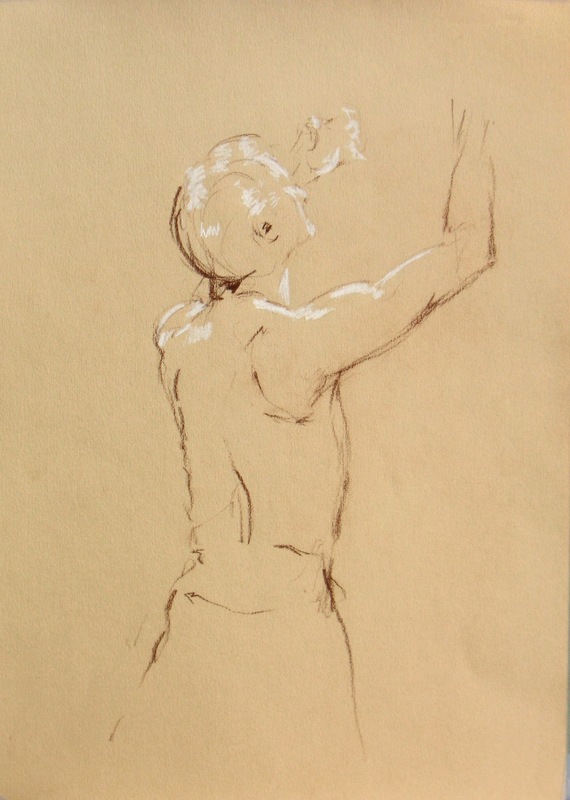 This entry was posted in Drawings, Figure Studies and tagged 15 minute figure study, figure drawing on toned paper, figure study on September 1, 2014 by ellentrezevant. Figure study. Pencil and conte crayon on toned pastel paper. 30 x 45 cm. or 11 3/4 x 17 3/4 inches. 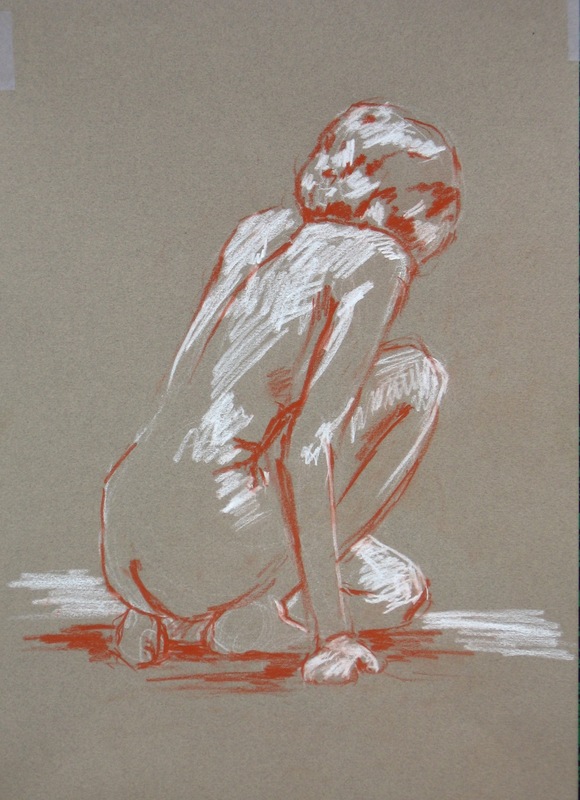 This entry was posted in Drawings, Figure Studies and tagged 15 minute figure study, figure drawing on toned paper, figure study on June 22, 2014 by ellentrezevant.